I’m still playing catch up this week, so . . . .
Twelve-year-old Paris Pan's life is a mess. She's just moved to a tiny town in Nowheresville, Oklahoma; her family life is a comical disaster; her new friends are more like frenemies; and the boy she has a crush on is a dork. Things couldn't possibly get worse, until she discovers that a girl mysteriously died years ago while taking a seventh-grade rite of passage–the Dare– right near Paris's new house. So when Paris starts hearing strange noises coming from the creepy run-down shed in her backyard, she thinks they could be a message from the ghost of a girl. But while she has no plans to make contact with the great beyond, her two new friends have other thoughts. Everyone who's anyone takes the Dare, and now it's Paris's turn. PowerPoint and racked up thousands of frequent flyer miles. Cynthea: My favorite scenes from PARIS PAN usually involve basketball and any PAN family member. The funnest characters to write? Had to be Verona and Papa Pan. These characters always had plenty of room to inject humor into the story and I didn't have to look very far because my real sister and father are pretty funny people (read: CRAZY). Me: (lol) Your family dynamic was excellent! I loved their accents! The Pans had me cracking up! What kind of writing projects are you currently working on? Or, if you aren't working on anything new, is there a different demographic/genre you wouldn't mind tackling in the future? Cynthea: I'd really like to tackle the Easy Reader market. There's an innocence there that I'd enjoy capturing in new stories that would appeal to this younger age group. Me: Who is your writing hero and why? Me: Yeah, Moms are great. Mine sells my book to her friends. . . . Thank you so much for stopping by, Cynthea! I have another interview for you! Today I’m talking to Cyn Balog, who is celebrating the release of her debut novel: FAIRY TALE. Morgan Sparks and Cam Browne are a match made in heaven. They've been best friends since birth, they tell each other everything, and oh yeah- they're totally hot for each other. But a week before their joint Sweet Sixteen bash, everything changes. Cam's awkward cousin Pip comes to stay, and Morgan is stunned when her formerly perfect boyfriend seems to be drifting away. When Morgan demands answers, she's shocked to discover the source of Cam's distance isn't another girl- it's another world. Pip claims that Cam is a fairy. No, seriously. A fairy. And now his people want Cam to return to their world and take his rightful place as Fairy King. Determined to keep Cam with her, Morgan plots to fool the fairies. But as Cam continues to change, she has to decide once and for all if he really is her destiny, and if their "perfect" love can weather an uncertain future. Cyn Balog is a normal, everyday Jersey Girl who always believed magical things can happen to us when we least expect them. She's also the Race & Event Manager for several national fitness magazines. She lives outside Allentown, Pennsylvania with her husband and young daughter. Both are 100% human, or so she thinks. FAIRY TALE is her first novel. Cyn: I have a lot of fun writing dialogue, especially when two characters are trading witty jabs at one another. I seem to do it in every book I write because I like coming up with sarcastic comebacks! Me: I love snarky comments! My best writing stems from characters who are yelling at each other. Go figure. What kind of writing projects are you currently working on? Or, if you aren't working on anything new, is there a different demographic/genre you wouldn't mind tackling in the future? Cyn: SLEEPLESS, coming from Delacorte in 2010, is about a Sandman who falls in love with a mortal girl whose sleep he controls. It's another YA paranormal. Me: That sounds amazing! I saw the cover on your blog: I *heart* it!! And finally: Who is your writing hero and why? Cyn: Judy Blume-- I grew up with her and I think it was reading her books that made me want to be a writer. I didn't have any real-life mentors growing up, so I think I just wanted to be Judy. I’m taking the lazy way out today. I’m working on a deadline this week, and I think every class I teach had a paper due over the weekend (how does it always work that way?). And so . . . I’m leaving you with an excerpt of One Wish to read and (hopefully) enjoy. I’d post something from my WIP, which I hit 55k on last night, but I don’t think it’s in a state where I’m ready to share. Urban Fantasy is way fun to write, but I’m not used to all the action . . . like car crashes and fires . . . and I think a character is going to DIE. I’ve never killed a character before. It should prove interesting. More on that later, though. It’s open to girls ages 13-18 anywhere in the world. If you know a girl in this age range, feel free to forward the info! Two hours later, I was standing outside in the freezing cold, waiting for my mom. “I swear, as soon as I’m sixteen, I’m applying for the first job I can get, and then I’m buying myself a car,” I muttered. My breath turned to smoke in the January air, and I rubbed my arms vigorously to keep warm. The door to the building opened behind me. I heard voices and laughter. “Oh, I didn’t know anyone was still here,” someone called. I turned around and watched as Steven and the blonde girl who was pouring drinks earlier walked toward me. “You can wait inside, you know. The building isn’t locked,” she continued. My eyes instantly fell to my feet and I began to blush. “Thank you,” I whispered. For someone who was supposed to be a budding starlet, I wasn’t handling my newfound attention very well. “I’m kind of new at all this,” I said with a shrug. I gave her a half-hearted smile. “I never really wanted to be in the spotlight,” I confessed. “Well, you’re going to be there now,” she replied, stepping off the sidewalk. “So you may as well get used to it!” Tabitha waved good-bye and crossed the parking lot. Steven answered, then, turning toward me, asked if I needed a ride home. Steven pulled out a sheet of paper from his clipboard and a pen from the pocket on his flannel shirt. I recognized the headlights of my mother’s car fast approaching. As soon as the door was shut and I was safely buckled in, my mother let the questions fly. “Who was that? What’s his name? Do you like him?” And more importantly, “Does he like you?” Notice that she wasn’t at all concerned for my safety as I waited in the dark, but wanted to know all about my love life. Those were her priorities. She was almost as concerned with my love life as she was with my weight—and that was way concerned. She looked over at me. “Or something? Wrenn, I think he likes you.” She spoke in hushed tones—like this was some huge, amazing secret. There was a funny look in her eyes—that twinkle—and I hoped it was from her “terrific” evening with Phil and not from whatever little ideas were now running through her simple mind. As always, I am full of randomness. . . .
1. First, I want to post the link to a fabulous review of ONE WISH from Wendy, who made my week not only through her kind words, but by posting her review on Amazon and pushing that one star “Worst Review Ever” off to the side. 2. Speaking of Worst Reviews Ever, I’m featured on the fabulous Alexa Young’s “Worst Review Ever” blog this week. Stop by to comment and vote, and check out some of the other reviews while you’re there. 3. Also, I wanted to send a shout out to the always amazing Cynthia Liu, who hosted an incredible auction/dare to help a Title I School. More than $13,000 dollars was raised! Woot! Congratulations to the winner of my auction, who bid $135 for a critique. I can’t wait to read your work! 4. This week I also learned about Albert Borris, a member of the class of 2k9, who suffered a stroke last year. He’s making great progress, but is still working on his speech and writing. Albert’s debut novel, CRASH INTO ME, which is about a group of suicidal teens who head on a road trip, is now available (and officially on my Must Read list). We’re rooting for you, Albert! Finally . . . I know a lot of authors post playlists for their novels when they are released, highlighting songs that relate to the book. I don’t have a playlist, but . . . I'm hosting a contest over on my LiveJournal blog. I wanted to take a moment to blog about this fabulous opportunity to help a Title I school fill their classrooms with books. This event, which runs through July 8th, is hosted by the fabulous Cynthea Liu over at: http://www.cynthealiu.com/. 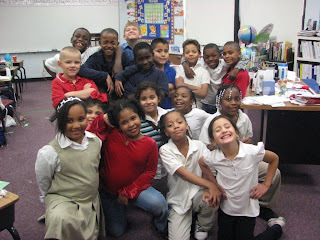 I teach third grade at Tulakes Elementary, a Title I school in Oklahoma City, Oklahoma. Children residing in our surrounding area or community live in an environment of high poverty, gang violence, and crime with the inherent social problems these issues generate. The children are so needy that many wear the same clothes several days in a row. Some do not know where their next meal is coming from. Our school receives little to no help from families that can barely afford to pay their bills. We at Tulakes love our children and want them to succeed. We know how important reading and writing is, but we don’t always have the funds to supplement what we have in the classroom. For most of our children, the only reading time they get is at school. The books we have in our classrooms are often ones the teachers have bought, but we are still sorely lacking leveled fiction and non-fiction books for each classroom. We would like our students to be able to get a book on their reading level at any time for writing, research, and enjoyment. While our school library and book room are resources available to us, there are just not enough books to go around and these kids can hardly spend enough time with their checked-out book before it has to go back and into the hands of another child. We also take 20 minutes each day in which the children read silently to themselves at their desks. We have used cardboard boxes in the past to hold those books, but these fall apart in such a short time. We would like to obtain more heavy-duty, plastic book boxes for each classroom. Books open a whole new world to our children. It is so exciting to see them reading, writing, doing research, and truly enjoying it. We would appreciate your help in jump-starting our 3rd grade level-reading program in the classroom. As an example, it costs approximately $700 for one leveled non-fiction classroom set. A sturdy book box we can use year after year is $3.25 per student. Our goal is to, over time, have small leveled-reading libraries in every classroom. Thank you so much for your help. You are making a difference in these children’s lives. There are many ways that you can help this school. Specific information can be found here: The Dare: http://www.cynthealiu.com/showyoucare/. Also, Authors, Agents, and Editors have teamed up to help Tulakes, and are auctioning critiques for YOUR manuscript. It doesn’t matter if you write picture books, middle grade novels, or YA; fiction or nonfiction; contemporary realistic, historical, or fantasy: there’s an auction for you. Here’s the list: http://www.cynthealiu.com/auction/. I’m helping out, too! Here’s the link to my auction: http://www.cynthealiu.com/new-three-chapter-critique-from-author-leigh-brescia-contemp-realistic/. The Prize: One critique of the first three chapters of your young adult novel (30 double-spaced pages max), which includes one full chapter of line edits and directional suggestions for the rest. So, if you get a moment, I hope you will check out the auctions and consider contributing to this worthy cause. I hope you’ll check out the links provided, and consider bidding at one of the auctions. This is an amazing opportunity to have your work critiqued by some of the most amazing people in the industry. AND . . . it’s for a good cause. Can’t beat that warm, fuzzy feeling that comes with helping others. Hi, I’m Leigh, and I’m a self-googler. Is googler even a word? Well, I just made it one. So yeah, I signed up for Google Alerts so I’d know immediately whenever something related to me or One Wish hit the internet . . . only I’ve found that it doesn’t catch everything . . . so I’ve become obsessed with googling myself to see what’s going on. The guy I’m sorta married to but not allowed to talk about online is concerned I’m vain. If I am, I blame him . . . and Louis Vuitton. Oh! And here it is at the Missoula Montana Library . . . but it’s been checked out! Yay! Whoever you are I hope you love it! And here I am on ebay! And . . . I have a signing set up for September in Elizabeth City at Page by Page: it’s already on their calendar!! Still waiting for confirmation about which bookstores will carry One Wish, and when they will be stocked. YOU can help, though! How? 1. Call or stop by your local bookstore (chain or independent) and ask them if they’re stocking One Wish. If they aren’t, ask: Why Not? 2. Ditto with the libraries! More and more libraries are jumping on the One Wish bandwagon every day (I know, because I’m stalking them on WorldCat), so check back often. Please don’t harass the librarians, though: we love them. 3. Encourage your friends to pick up a copy, or buy one for a friend. to have more Amazon reviews so a certain other review (cough cough) skips to another page. I’m planning blitzkrieg promotion this fall, so stay tuned for details. I may be looking for street team members (girls between the ages of 13-17) to help me out.